That is probably very true, but now I know better. For the sake of historical accuracy I would have had no qualms if it was a caucasian of dark or light complexion or anything between as these are among traits typical to Iranians. I was willing to read your opinions and take them seriously until you posted the above. It is a very biased, unwarranted and uneducated statement. I know that there are some American authors not worth reading..as there are the same from any other country..but to say you will never read anything by an American author makes me think that your opinions must be based on a very slanted, narrow viewpoint... and therefore I could no longer take them seriously. It's too bad.. this board could have some very intelligent interesting discussions going..I am the first to admit that I could learn alot about the different issues brought up... but they always seem to develop into this type of nationality bashing and narrow minded statements. It makes me avoid this board all together and definitely some of the threads in particular. The Americans are a good people. Just because they have someone with a family grudge in power does not make them bad. In exactly the same way that though we Brits have Call-me-Tony in power does not mean we are all America's Lackys. Everyone should read books on any subject the are interested on no matter what the race of the author. If I happen to dislike say.........the French (hypotheticaly) I'm not just going to stop reading all books written by them now am I?? Davood, you need to read historical information written by people other than Nazi cultural archeologists and Racist Europeans who would wish that all civilisation in the world evolved from Europe. I have opined on the basis of scientific and accurate historical information. Proto Iranians formed between the Caspian and Aral seas, and yes, they were Aryans, a term hijacked by Hitler in a vein attempt to gain ancient identity for the Germans. 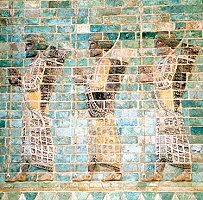 Look at some pre islamic artwork, we were and are by no means blonde haired, blue eyed Germans. And for your information light features are no exclusive to Europe. The oldest civilisations are from the mid east, so yes, it is fair to say that our ancestors WERE civilised byt he established peoples of the middle east. This proves my point, the Iranics Iranianised (culturally and linguistically) the dark skinned Elamites, who were the predominant people in the South West of Iran and over the centuries mixed with them and the results were and are the Iranians of yesterday and today. I think we've gone far enough on Iranian racial debates. Topic closed.